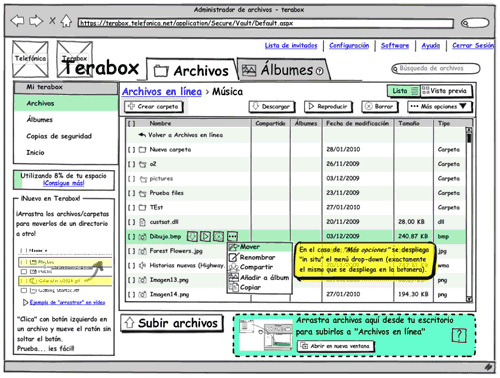 Terabox is Movistar cloud storage service, free for ADSL subscribers. Its first version was underperforming due in part to an over-complicated user interface. 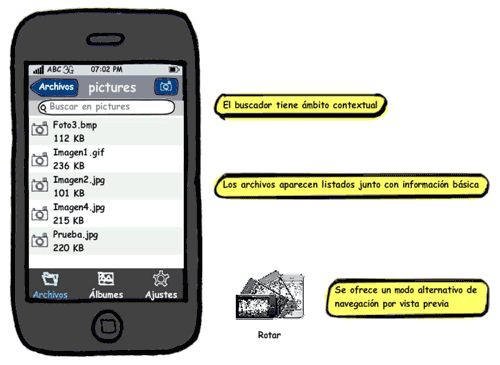 Telefónica I+D redesigned its web and created its mobile application interface. We are always short on storage. No matter how large your hard drive is, or how many GB of music your mobile phone can hold, it is never enough. Furthermore, you want to access that content everywhere. We do not want to wait until we get home to watch our holiday’s photos again, or browse that document we’re working on. Cloud storage solves this, and Terabox is Movistar’s cloud storage service, free for its ADSL subscribers. Terabox was a nice (and free!) little service, but users were having problems interacting with it. 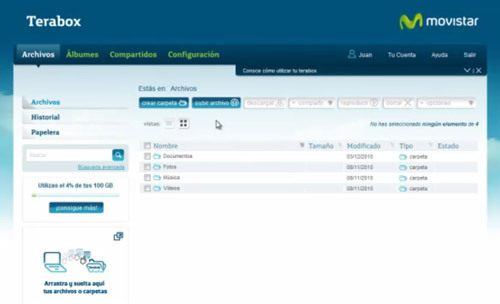 Movistar asked Telefónica I+D (R&D) to redesign its web interface, while keeping the functionalities of the service. This also led us to create its mobile application. Terabox was being designed by Telefónica I+D Madrid UX team, but Movistar wanted to test several different approaches and our Barcelona UX team was invited to participate. We started researching the current Terabox solution, while conducting competitive research on other similar products in the market. 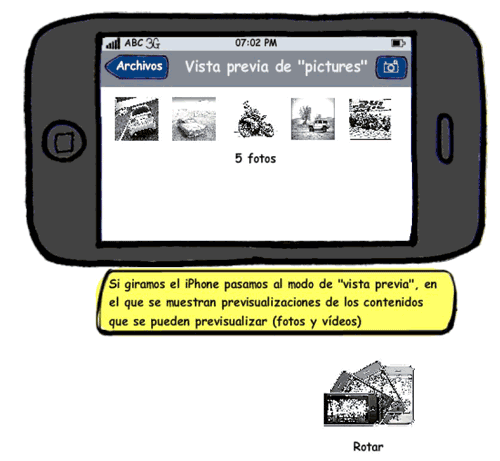 At first Movistar just wanted to test our skills helping them shape the “album” functionality. 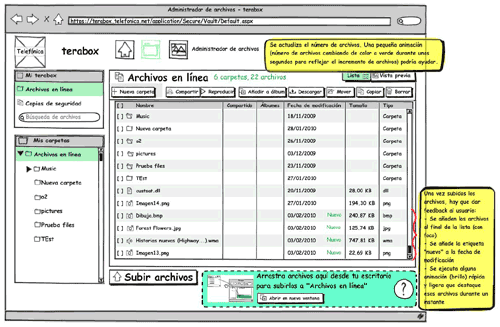 I prepared a simple set of annotated wireframes (created with Balsamiq) that simplified the current interface and offered better feedback to the customer with contextual information and menus. These worked very well, and soon Movistar wanted to get our input on some other processes that were regarded as sub-optimal, like uploading files and playing multimedia content. We created a mid-fi prototype with Balsamiq (including some limited interaction), while sticking to the current interface with some minor changes. Movistar loved these and asked for more, looking for our ideas on the general web interface, and also looking for our input for a future mobile application. Now that we had their trust, we were able to suggest bigger changes to the interface, while owning the new mobile application design from the start. We created an interactive prototype with Balsamiq that simulated different layouts depending on device’s orientation. Earned client’s trust by gradually suggesting improvements to current design, which allowed me to propose modifications to the whole service afterwards. Experience on creating a mobile application based on a previous web design.